Debra’s work investigates the nuances of color with a mix of vibrant and subtle fabrics, creating a matrix of illusion. Debra’s art explores peaceful scenery as motifs with a strange attracting force and seduced reality. 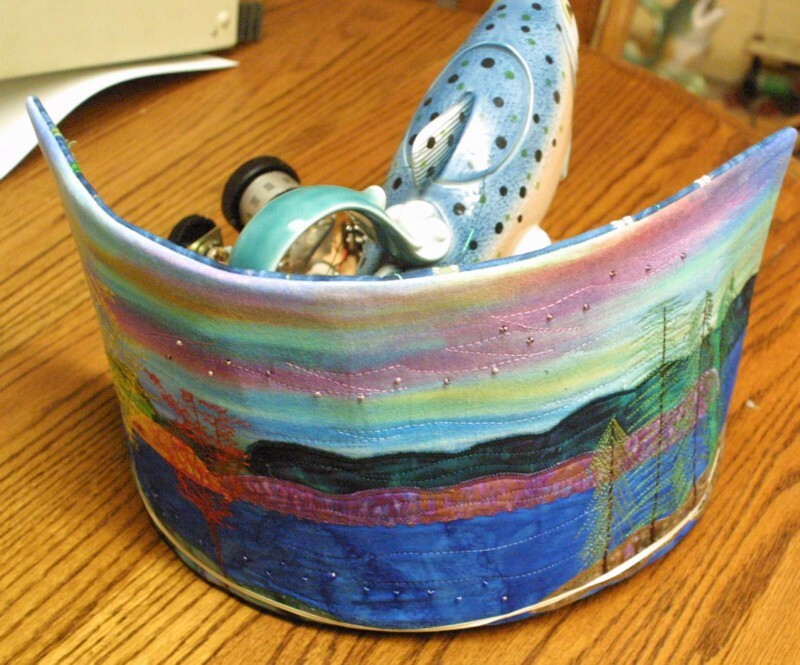 Debra creates meditative environments which suggest the expansion of art. Debra started Quilt the Walls, Etc. in 1997. Rather than make traditional quilts, Debra took her love of home décor’ & color and self-taught herself to create landscape art quilts. 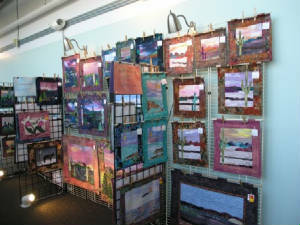 The Landscapes are created with unusual batiks, hand dyed fabrics, screen prints & painted and color crayon skies. You might even see a glimpse of photo printing on fabric! I am a retired research engineer. I completed two engineering graduate degrees at the University of Minnesota, a Masters degree in Electrical Engineering and a doctorate in Control Science and Dynamical Systems, as well as several patents over some three decades of a professional technical career. Having "been there and done that", I have now turned to the Arts, which often typifies the lives of retired engineers and scientists. This is not as unusual as it may seem, for the Arts are really very practical and comforting versions of science and engineering. The Arts are a pleasant meld of colors, sounds and textures that all have analogs in the physical sciences but with a decided advantage of subjectively valid human perception. My most recent basement effort has resulted in three working radios from St. Paul, Minnesota. 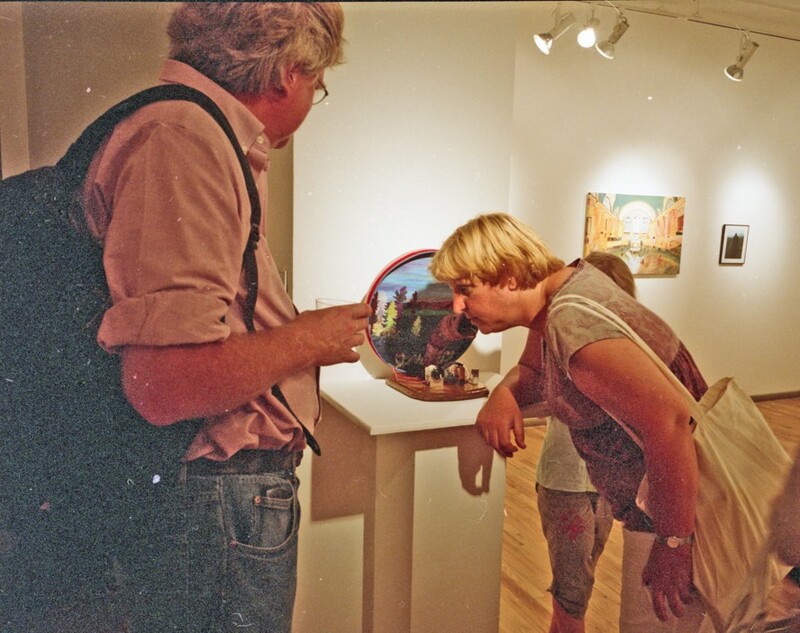 The three pieces in this show are meant to illustrate aspects of life in Minnesota during the summer. Although a distinctively rural state, the highly technical nature of Minnesota is driven by the excellence and accessibility of its public and private colleges and universities, which fuel an educated and adaptable workforce. The rural landscape as dotted by over 10,000 freshwater lakes, provides a unique venue that supports fishing, water sports and farming. Aspects of life in Minnesota are represented by the three pieces presented in this show with contributions by Minnesota artists, Debra (fiber artist, www.quiltthewallsetc.com) plus Courtney & Aryn Kern who create laminates of Minnesota hardwoods (www.longshadowwoodworks.com). 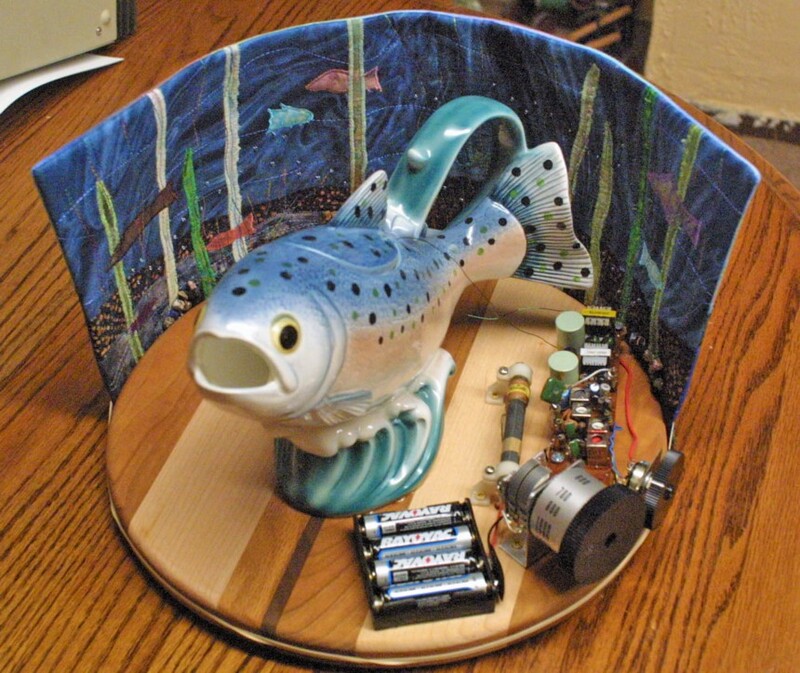 The fish radio is a fish pitcher modified by the inclusion of a speaker. This had to be done in a way to get a reasonable sound, but also look like a fish. A look down the open fish mouth reveals the speaker at the end of a paper cone, so that it looks like the throat of the fish. 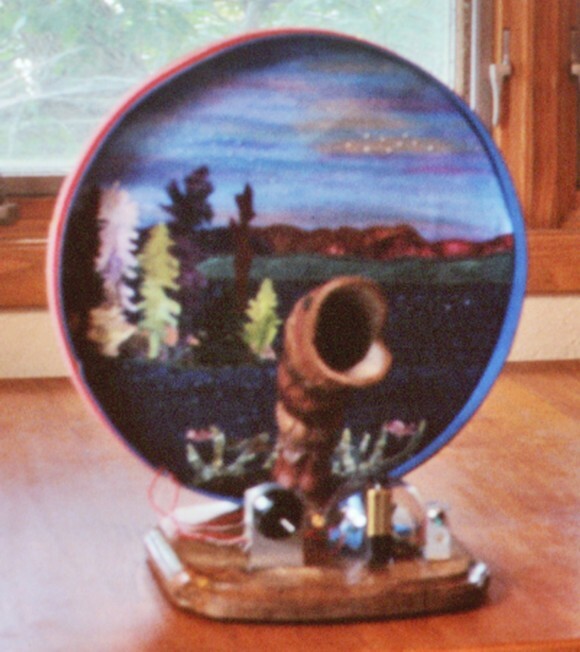 The base of the radio is hardwood laminate and the fiber background with the fish side underwater and the other side above water was cleverly conceived by the fiber artist. The lake radio is based upon the remains of a RCA type 103 wooden speaker frame mounted upon a laminate hardwood base. No collectable, intact antique radio was harmed by the creation of this radio. 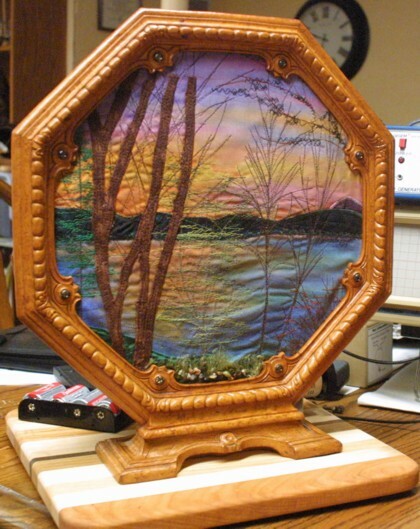 Instead of the missing original cloth speaker grille, the fiber artist substituted her impression of a photograph I took of a Fishtrap Lake sunset during the summer of 1968. 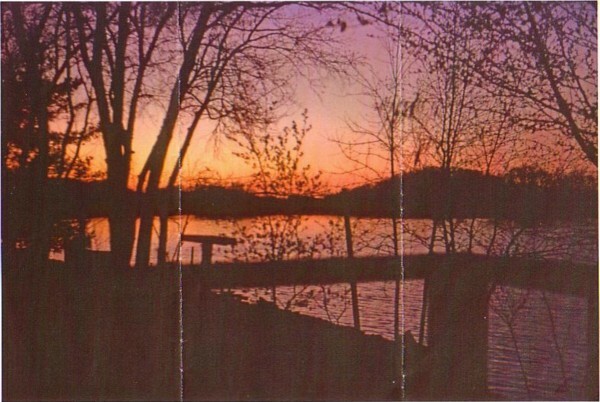 Fishtrap Lake is located about 20 miles north of Little Falls, Minnesota. 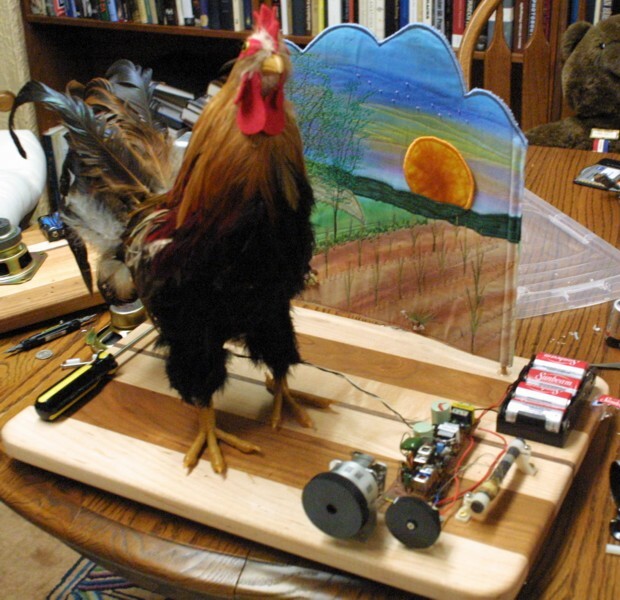 The rooster radio is made from a hollow decorative bird obtained from a craft store. It was converted by the addition of a speaker. 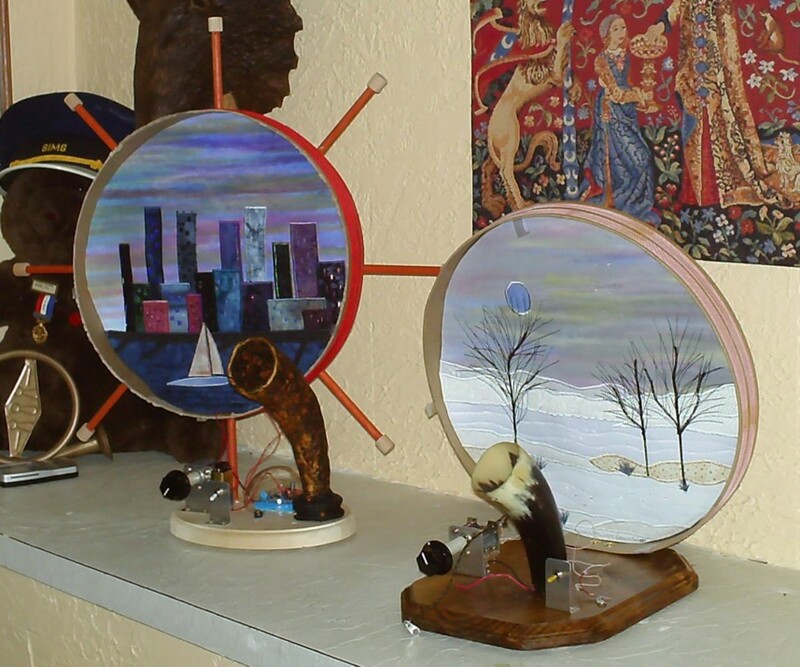 He stands on a hardwood base ready to be tuned to a radio station at sunrise as shown by the fiber artist. The other side of the fiber background shows a road that leads away from the farm where the rooster lives, or rather, plays. ...to fabric landscape interpretation of photo & completed radio. Here is the completed work of the collaborative effort which was on display at Ceres Gallery in New York City, in the Seventeenth Ceres Friends Exhibition, July 14th-August 8th, 2009. The "Fish" Radio. The sound comes from the mouth of the fish. The Fish radios have no radio tubes in them; they are all basically crystal sets. Crystal sets date back to over 100 years ago at the very beginning of radio. At that time is was necessary to poke at a real crystal with a probe that looked sort of like a safety pin to find a spot that worked to detect radio waves. The Fish radios are ready-made crystals, germanium diodes, that are about 50 years old. Crystal radios are not very loud and need headphones, but the Fish radios have speakers. 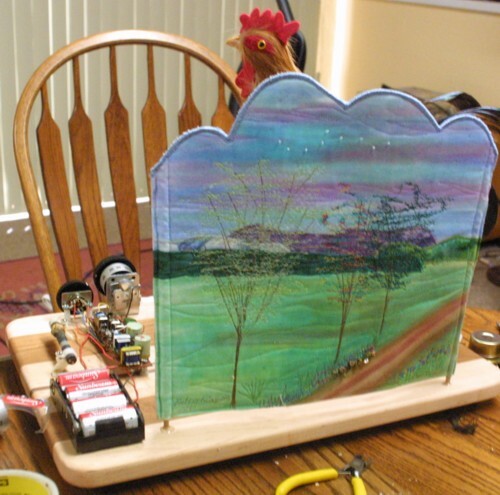 The Fish radios merge old and new technology, in that the crystal radio is amplified by an integrated circuit to operate the small speaker in the bottom of the fish. Although crystal radios are often thought of as inconvenient affairs, with wires hooked up as an antenna & grounded to a water pipe, it is possible to make them with a wire wound around a circular form that takes the place of a long antenna & ground wire. This is not as sensitve to radio stations, but modern radio stations are so powerful, that in an urban area the Fish radios can receive several stations & be portable. For the technically minded, the Fish radios use 1N69 germanium crystal diodes & an LM386 integrated circuit amplifier chip running on a 9 volt battery. 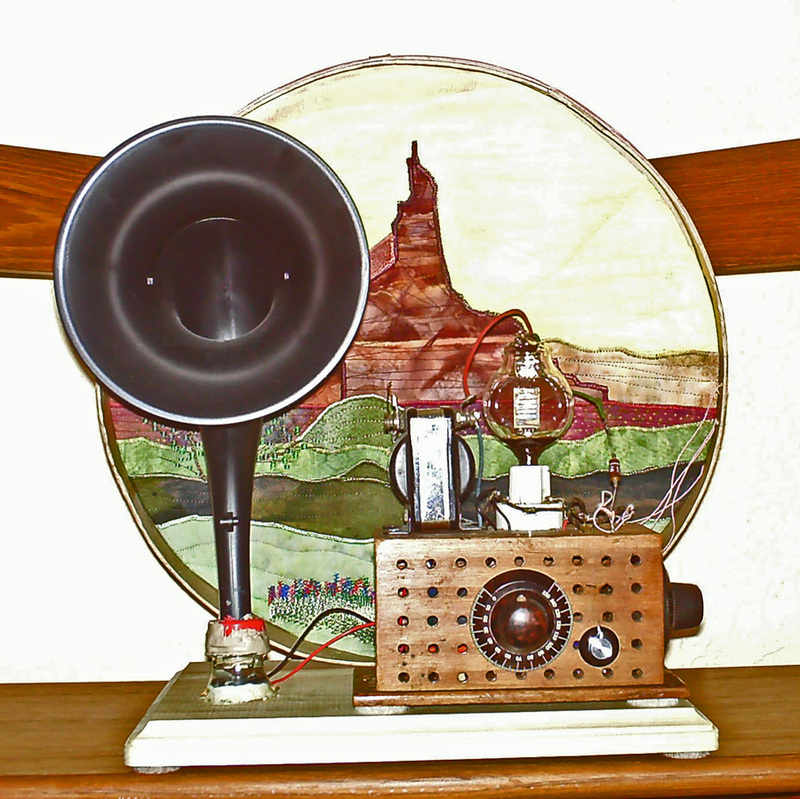 It's a radio based upon a copy of a 100 year old radio tube design; called an "Audion". It was not a high vacuum device like most modern radio tubes. The Audion was the first of the radio tubes in the modern sense because it had a "grid". Because it was not a high vacuum device it required adjustments so that it would not glow a blue color, which meant it wasn't working properly. All modern radios trace their ancestry to the Audion. It was a seminal development in the history of electrical engineering that quite literally changed the world. 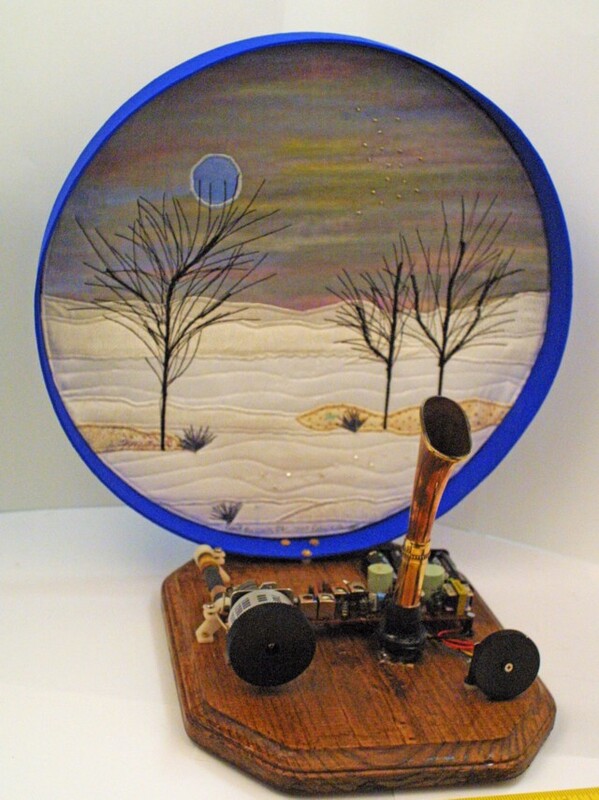 The antenna for the radio surrounds the quilt and the radio has adjustments for the Audion copy. Visible is the round turning knob, the larger knob and and next to it is the smaller "plate" voltage adjustment knob. On the side of the radio is the "fliament" voltage adjustment and not visible is the power switch for the speaker amplifier. The black horn-like part to the left is the speaker which is a copy of a 1920's-type "horn speaker". The Audion copy is the round glass bulb on the top of the wooden box that has the adjustment knobs on it.